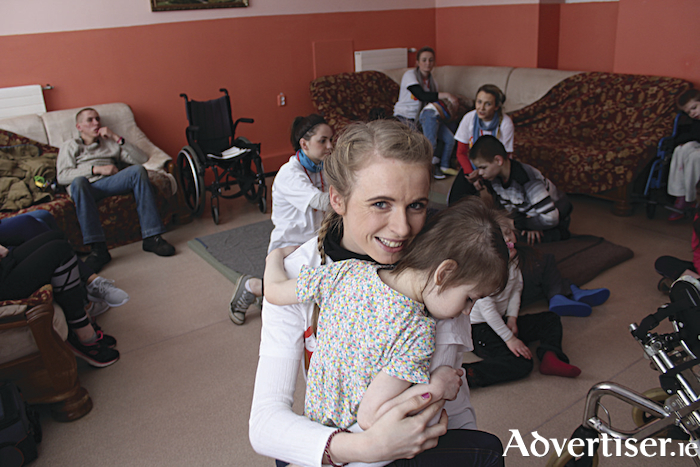 Galway Rose Niamh Elwood pictured hugging the children at the orphanage at Vesnova. None of them were even born when the accident took place in Chernobyl 32 years ago this April. Yet, the effects of that terrible day, still being felt in the generations that have followed, left a massive impact on the group of women who have just returned from a trip to that devastated region. Among them two women well known here in Galway — Galway Rose Niamh Elwood, a nurse in the Acute Medical Unit in UHG and the international Rose of Tralee Jennifer Byrne, herself a junior doctor. They joined Adi Roche and 26 fellow Roses for a week of caring for the children in Vesnova Childrens Mental Asylum, where victims who are still being born with dreadful deformities and illnesses are sent to by the State authorities. The Roses’ misson was to provide one-to-one attention to the children who are left very much alone all day with feeding and nappy changes being the only attention they get. The fact that Niamh and Jennifer, among others are qualified medical professionals proved to be extremely helpful in treating the victims of a tragedy that happened before either they or their charges were born. While there, the women were also shown some of the projects that Adi Roche is responsible for such as “Homes of Hope” where healthier children are fostered to a loving family instead of being admitted to orphanages or other institutions. Speaking to the Galway Advertiser last evening, Niamh Elwood, from Castlegar said that the trip to Belarus has been a life changing experience and was incredibly emotional. “I have just returned from probably the most amazing experience of my life. Being in Vesnova Children Mental Asylum has shown me of the good that is still out there in this world,” she said. “Chernobyl Children International have transformed this home of 170 children and young adults into one of love and hope. As a nurse, I was shocked by the conditions in which the carers and nurses in Vesnova must work in. “Although at times things were done in a way in which I may not agree with, I understand that they are doing the best that they can in these conditions. The power of touch is what guided me through my days in Vesnova. “I have hugged more people then I could even count. The smiles of these children made the trip so rewarding. I cannot thank people enough for their kind donations. “CCI are using all these funds in such an extrordinary way. I want to thank the CCI leaders for minding us on this trip. The strength of the volunteers pushes me to become stronger. I hope that this is the beginning of a strong relationship between myself CCI and I. There is hope, and it is you,” she said. This is the seventh year that Roses have travelled over to Belarus with many Galway Roses having already made a difference over there. The women pay for their own flights and expenses and fundraise to help the children get the basic medical supplies and care that they need. These Roses were not even born when the Chernobyl accident happened in 1986 and it is shocking to think that children are still being born with the effects of radiation and will be for many years to come. Despite being 280 km from the Chernobyl Nuclear plant, the Roses could not wash or drink the water over there. All food consumed was imported and only bottled water for drinking, but the children in the orphanage drink this water every day.